Please note: Baseball was played on this site longer than anywhere else in the world. This park was first used as a open lot for baseball in the 1860s. As a result, many parks have existed here. This park was not at all successful. After three seasons, the team folded and the park became abandoned. 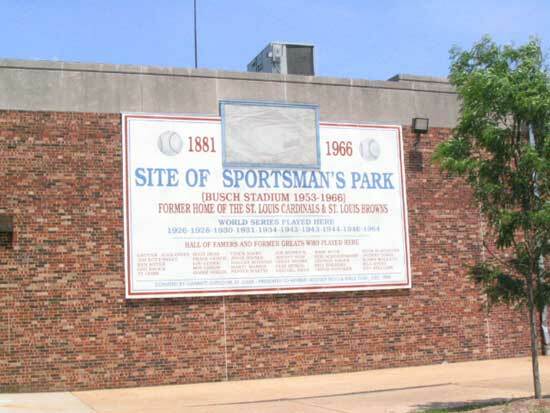 When Grand Avenue Park fell into disrepair, Alfred H. Spink organized the Sportsman's Park and Club Association, which renovated the park for a major league team. Soon beer and whiskey maven, Chris Von der Ahe, purchased the team and took over. Let the games begin. Von der Ahe bought the team to drive liquor sales at his saloon but soon fell in love with them and dumped a lot of money into them and his park, including installation of the tall iron columns supporting the roof of the grandstand. The Spanish American War brought tough times for many people, including Von der Ahe. He decided he was going to use his park year round and created the "Coney Island of the West". He installed a honky-tonk amusement park and a wine room. He also installed a racetrack and a beer garden, which was in play. The original park burned in 1891, but was not abandoned until after the 1892 season. Fires caused Von der Ahe to loose his team. He was up to his chin in lawsuits due to deaths and injuries of customers. He ended up loosing his team, which was renamed the Cardinals, and they moved to Robison Field. The newly relocated (from Milwaukee) St. Louis Browns need a place to play, so hey, why not move into the abandoned park at Grand and Dodier. This park was still wooden. In 1909, the Browns would reinforce the structure with concrete and steel, creating the famous Sportsman's Park. August 21, 1931, Babe Ruth hits his 600th home run. April 23, 1954, Home Run King, Henry Aaron, hits his first Major League home run. The curved grandstand that was used in Sportsman's Park (II) was continued to be used until 1912. At that time, it was replaced with a rectangular single-decked grandstand. In 1912, the grandstand was continued down the right field wall. In the winter of 1925 to 1926, the stands were double-decked. 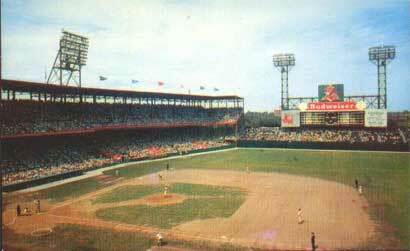 In 1926, the bleachers were expanded and the bleachers in the right field section were covered, creating a grandstand. In the 1930s, a goat grazed in the outfield, helping out the grounds crew. In the 1940s, this was the only park that still had Jim Crow laws. The right field covered bleachers were reserved for blacks only. There was a screen up in front of this section, making it the only extended seating area where you could not catch a homerun. On August 19, 1951, Eddie Gaedel, number 1/8, 3'7", 65 lbs., came to the plate. This was a stunt on Bill Veeck parts. He told Gaedel he would fine him if he swung the bat. Since the strike zone on this guy was so small, the pitcher walked him on four pitches, and he was pinch run for. When Cardinals owner, Gussie Busch, bought the park from the Browns in 1953, he wanted to name it Budweiser Stadium, but MLB didn't want a park named after a beer (Miller Park, Coors Field), so they called it Busch. In 1954, the Busch Eagle would flap its wings after each Cardinals homerun. On the last day of this ballpark, 17,803 showed up to say goodbye. At the end of the game, the band started to play Auld Lang Syne as the home plate was helicoptered away to Busch Stadium II. While fans were filing out, a bulldozer crashed through the centerfield wall. © 2005-17 Paul Healey. Photographs of the old stadium © their owners. Used without permission.